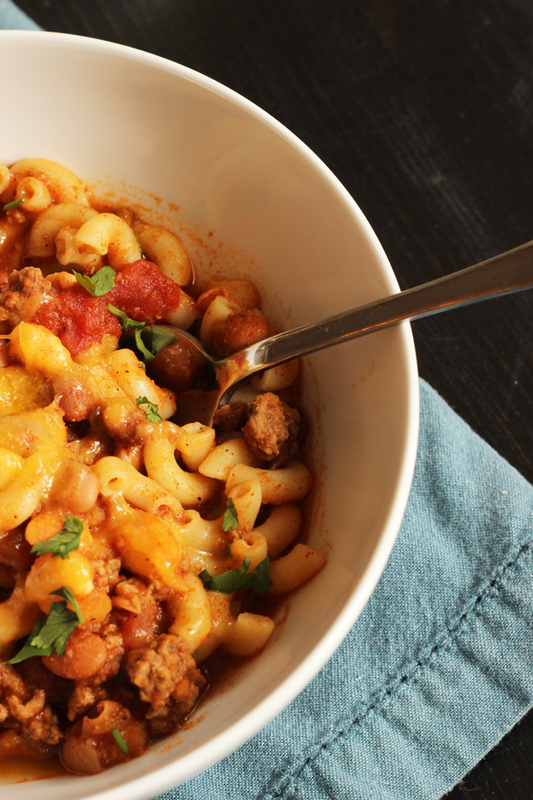 This simple Chili Mac Recipe is very make-ahead and super good. It’s good old fashioned comfort food that gives you the night off cooking with delicious results. 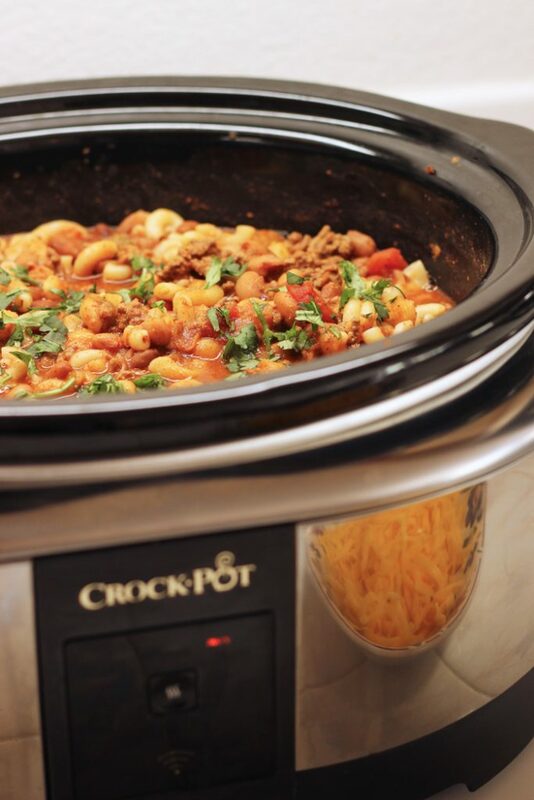 I love the ease that comes with cooking in the Crockpot (aka Crock-pot, aka slow cooker). It cooks and keeps food warm for you while you do other things. But, it’s not perfect, you know? I mean does it clean up dinner? No. But, also, it makes some food soggy. Some of those “Crockpot freezer meals” you see on Pinterest just won’t turn out. Trust me. It’s not like the slow cooker is a miracle worker. It’s an electric braiser, essentially. It does a great job on cheap, tough cuts of meat that benefit from low and slow heating. It can make great soups, stews, and chiles. But, not all recipes can go in and out of the Crockpot the way that you want them to. Pasta is one of those tricky things. I’ve had some success with cooking tortellini long and slow in the Crockpot, but other noodles can turn into a soggy mess. Not so with this Chili Mac recipe. The basic Chili Mac recipe includes macaroni and chili with cheese in or on the dish. Different versions abound as do very similar style comfort foods. In my family we just called it goulash. In this rendition of the chili mac recipe, I prepare the meat and bean chili in the slow cooker, stir in the noodles at serving, and let diners add however much or little cheese they want at the end. It’s like the best of all worlds: ease of preparation, not-soggy noodles, and all the cheese you want. You might be tempted to add the noodles at the beginning of cooking. I choose not to risk the sogginess. Instead, in the morning while you’re browning the meat for the chili, boil the macaroni noodles al dente. Rinse and drain the macaroni and chill it in the fridge while the chili cooks all day. Adding the cold noodles to the pot just a few minutes before serving allows you to have perfectly cooked noodles without the mush. You can also cook the noodles at serving time and simply serve them together. Some folks prefer to have their chili atop the mac not mixed together. Do what you like as long as you enjoy some hearty comfort food. This simple Chili Mac Recipe is very make-ahead and super good. It’s good old fashioned comfort food that gives you the night off cooking. In a large skillet over medium high heat, brown the ground beef. Season to taste with salt and pepper and transfer the meat to the crock of the slow cooker. Add the beans, tomatoes, chicken broth, tomato sauce, green chiles, chili powder, onion powder, garlic powder, and cumin. Stir well to combine. Cook on HIGH for 4 hours, or on LOW for 6 to 8 hours. At some point before serving, cook the macaroni to al dente, according to package directions. Rinse and drain. Chill if making several hours in advance. At serving time, stir in the macaroni and serve with shredded cheese and chopped cilantro. This is the Crock-pot pictured. I don’t typically use the wifi-enabled controls because my iphone is old and rickety. We get to eat this in about half an hour. The husband forgot to plug in the crockpot so I am making it on the stove top. It smells delicious! I subbed Mexican chili powder and pintos with chipotle as it was what I had. I have tons of shredded cheese ready to top it with because everything is better with tons of cheese. I’m thinking a bit of sour cream too. The food didn’t sit out all day, right? Oh No, his job was to take it out of the refrigerator and plug it in. It turned out fine cooking it on the stove top. I am so doing this for an easy late night Christmas get together….thank you for the recipe inspiration! Everything that is cooked in a slow cooker can be made on the stove but can everything on the stove be made in the slow cooker? It really depends on what it is. Sauteed vegetables will be soggy and mushy in a slow cooker. Other items like chili, stew, or soup are often adaptable to slow cooking. Did you have any specific recipes in mind?